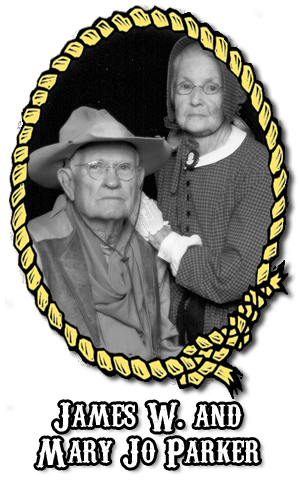 When the Chisholm Trail Historical Society was incorporated in 1990, J. W. was a founding member. He went on to publish two more books; Riders of the Chisholm Trail and Twilight of the Chisholm Trail. Until 2010, J. W. and wife Mary Jo made hundreds of visits to schools, symposiums, lectures both locally and across the states. He made a trip to Australia and has been filmed numerous times with reinditions of the old west. When we asked for permission to use excerpts from his writings, his response was: “I’d be honored”. At the 2010 Festival, they expanded their history research to include information on this area and the various other trails that crossed Oklahoma beginning with the Spanish and French Explorers, including maps and notes about the Louisiana Purchase. Consequently, 14 flags welcome visitors to the Festival annually and “PARKER STATION” stands as a reminder of the Chisholm Trail treasure in Yukon, Oklahoma – J. W. and Mary Jo Parker. Yukon is blessed with landmarks of its cattle driving history. To take an airplane ride over the sprawling suburbs of the modern community becomes a fascinating history lesson. From the air, physical signs and the geography of the land reveal deep ruts from old wagon tracks and terrain eroded by thousands of hooves. These are the physical alterations that cannot be discerned by the casual observer walking or driving around, but they offer proof positive that the Chisholm trail of worldwide fame passed through, right here, and we’re mighty proud of that fact! Anyone wanting to achieve a sense of that history could fly over the city in a low-flying plane and follow a map that re-traces the path the herds followed as they headed for Kansas. It would probably be a lot easier and more practical, however, to take a leisurely drive on our modern roads and look for the landmarks that are clearly visible. Ready for a tour? Let’s go! First, locate State Highway 92. It’s the westernmost. highway in Yukon and it assumes several names. From Main Street You’ll meet it as 11th Streets (at other points, it’s called “Cemetery Road,”) To begin identifying the route ofthe Chisholm Trail, begin on SH 92, a few miles south of Main Street, at the intersection of SH 92 and West Reno Road. From there, head north to follow a meandering, wide swath of geography that transported all that beef to northern markets. On the west side of SH 92, you’ll be looking at the William Wedman farmland, which occupies land directly on the trail, Just about 200 yards south of a neat, pinkish brick house on the west side of the highway, the Trail crossed over SH 92 onto land that became the John Kouba farm. You’ll spot the Kouba house and barn on the east side of the road. Continuing north, the cattle were herded through what is today the Milton Shedeck Farm, within sight of Interstate 40. That house and farm buildings are visible on the east side of SH 92. At this point on our historic tour, the imagination has to work hard to envision what was empty land, without settlement of any kind. Remember that Yukon didn’t come into being until after the Land Run of 1889 – and by that time, the cattle driving had gone elsewhere, During the years of heavy Chisholm Trail traffic, the only humans to be seen were the drovers, and there were no farms or homes or roads, only the obvious beaten trail pounded out by the wagons, horses, and Longhoms. So, once we proceed north along 11th Street and past the ramp leading to Interstate 40, the horizon is so full of man-made improve ments that it is hard to imagine a time when there were no signs of civilization, just open land. Actually, the Trail went through the sprawling Chisholm West Shopping Center on the right In fact, the receiving ducks at the rear of the Wal-Mart and C.R. Anthony stores occupy deadcenter of the old Trail. It’s not easy to reconcile dusty Longhorns with today’s commerce, is it? Turning right on Vandament Avenue, we get some help from an attractive and informative granite marker. It is positioned in the center of a neatly landscaped area set off by a red brick wall. That marker rests on the exact center of the Chisholm Trail! The land is now part of the Kirkpatrick Family holdings. Be sure to allot a few minutes to study the message and map engraved on the marker. You can’t help but feel a sense of real history as you stand on that spot. Returning to 11th Street, continue north and you’ll be looking at the continuation of the Trail. All those school buildings, a modern complex of structures that serve Yukon’s High and Mid-High Schools are on land the cattle were driven over. Turn right at Yukon Avenue, going past the high school’s parking lot, and tum left on 9th Street. The Trail continues past the former Yukon Mid High School on the left. Keep going straight until you cross Main Street, where you’ll spot Vian’s Radiator Shop. Then continue north on 9th, crossing the railroad tracks. At this point, you’ll notice how the land dips. The embankment was eroded long ago by the traffic along the Trail. At this juncture the Trail angled to the northeast to cross the North Canadian River about a quarter of a mile west of the bridge of today’s SH 4. The paved roads today do not follow the exact trail, but the cattle were driven north and about a mile west of what became Piedmont. Please don’t leave Yukon without visiting another very historic site, Yukon’s City Park. Today it’s a very attractive recreational fishing and picnicking area, but it was once a refreshing sanctuary for trail-weary cattle drovers. The location of Mulvey Pond in the City Park is reached from Vandament Avenue. Tum south on Holly Avenue and you’ll soon see the sparkling water of the pond on the east or left side of the road. The Yukon Centennial Committee plans to erect a marker which will cite the historic details of the old spring that made Yukon a favored overnight rest stop for the men of the Chisholm Trail. Before Yukon was settled by hornesteaders, a very active clear spring issued from the hillside. 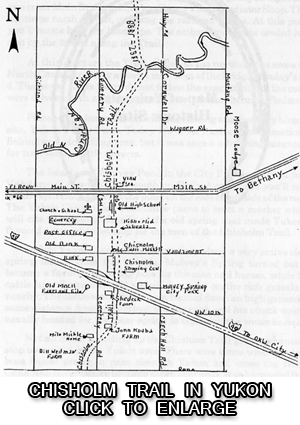 Mulvey’s Spring turned out to become a favorite watering hole for the men and horses, while the cattle happily grazed and rested overnight on the rich grassland nearby. The cattle would have been bedded down on high ground at some distance from the spring, but the cook and his chuck wagon usually headed for the clear spring to replenish the water barrels. Not all herds traveling up the Chisholm Trail got the chance to stop overnight in the Yukon area. There were times when the trail boss would prefer to pass through Yukon and cross the North Canadian River before bedding down the cattle. It so happened that the trailing distance between crossings of the South and the North Canadian Rivers was from 12 to 14 miles, an average day’s trip. However, if the boss knew that the North Canadian’s waters were too high for fording, he might want to delay reaching the river until it had receded. In that event, the stopover at Yukon was welcome. Designed & Powered by | Click Media Co.